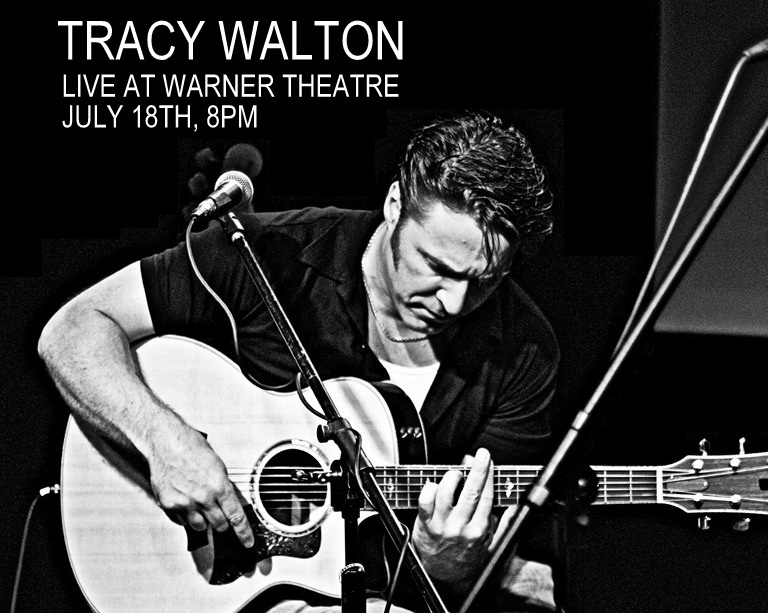 Tracy Walton Live at the Warner Theatre (Saturday 7/18/2015 at 8pm) is THE BIG EVENT for July and I’m going to tell you why you need to be there! First and foremost, this is going to be a big concert because the music will be extraordinary. Tracy Walton’s music has been a staple in the local scene and with good reason, he’s a natural born storyteller and his music has delighted audiences up and down the east coast. His CD release party was held at Daryl Hall’s House Club in New York. And every Tracy Walton show is entertaining but he’s taking it to another level with this show. A full band will accompany Walton as he performs the latest album “Moderately Unknown” which will create a full sound befitting the venue and the event. One BIG reason to go to this show is that there’s an All-star list of performers who will join Tracy Walton like Julia Autumn Ford, Jay Roberts, Lee Ann Lovelace, Becky Kessler, Glen Nelson and more will perform some of their favorite Tracy Walton classics! Each of these performers sells out concerts in their own right, and for one night, all of these performers will be at the Warner to bring something to the night’s entertainment! But I’ve got something else to consider about why we need to support this show. It’s also going to be a BIG concert because what it represents. It represents an important milestone for Tracy Walton as a performer and an important milestone for the Warner Theatre in Torrington. As Tracy Walton fans already know, Walton always searches for ways to make his community better and uses his talent to effect positive change. Walton’s on the board of Performance Hub, he’s worked with Music in Common, in fact he was honored last year by Torrington’s Mayor Elinor Carbone for his commitment to helping new artists. He’s worked with musicians to create their own records at On Deck Studio and this year created Fuse Fest, a new music festival in Fuessenich Park! So a performance at Warner Nancy Marine Studio is big for Walton; it is a significant “coming home” event. There is also significance for the Warner Theatre organization itself. If this concert is successful it will demonstrate that the Warner Theatre’s Nancy Marine Studio is a viable local indoor venue for well-known regional musicians to perform for a 300 plus audience. This will open the door for other artists to perform and Torrington will benefit from the use of this location in this way. And if we love music, we need to support the artists who create it. In today’s music media landscape the consolidation of the ownership of commercial radio stations, the shrinking of prominent record labels but the continued bias of national media toward artists signed with prominent record labels has created a dearth of opportunities for exceptional regional talents to expand a national audience even as technology provides a nearly unlimited opportunity to record music and share it with the world via the internet. This means that while the technology exists to share music created in CT with an audience in, say, McCook, Nebraska or West Bend, Indiana, the system is constructed is such a way that the audience would be unaware that the music exists. So we need to go to concerts because this is how we say that we as a community value music, that we as a community value the musician. This is a BIG concert in many ways. It’s why I am going and I hope to see you there!